Spring is finally here! The weather is warming up and if spring cleaning fever hasn’t hit you yet, it probably will soon. There is just something about spring that inspires people (us included!) to get their homes clean and organized. For a lot of people, the most disorganized space in their home is their garage. Spring is a great time to tackle that great garage clean out that you’ve been putting off. You can open your garage door and let in a cool spring breeze while you sort, organize, and clean. If you are going to take on the garage as part of your spring cleaning chores, our Boston garage door repair team has some helpful hints so you can get the job done. Get all of your annual maintenance done. Spring is the perfect time to get all of your annual maintenance done. Our garage door repair team can come out and perform maintenance on your garage door, ensuring that springs, hinges, tracks, and automatic garage door openers are all in good repair and ready to take on the demands of your busy summer. If any repairs are needed, we’ll get it done for you at a reasonable price. Move items into keep, donate, and trash. Sort all the items you are storing in your garage into three piles: keep, donate, and trash. The key to a great garage clean out is to take care of those piles once you have them sorted. Get your trash to the dump or recycling center as soon as possible. Take advantage of charities that offer donation pick up services. And finally, make sure that everything you decide to keep has a spot in your garage. Utilize your wall space for organization. Now that you know what you are keeping, make sure it has a space of its own in your garage! You can utilize your wall space for extra storage, or if you are lucky enough to have an attic space above your garage, you can even store seldom-used items up there. The goal should be to free up more of your floor space so you can park your vehicle or use the space for other projects. Give everything a good cleaning. Finally, give the entire space a good clean. Sweep out the floor space to get rid of any debris that’s collected there over the winter months. You can scrub a cement garage floor with soap and water with a good scrub brush to get rid of stains. Don’t forget to give your garage door some attention, too. You can also clean most garage doors by simply spraying them off with a garden hose. This can remove the dirt and could even improve their performance. Once the garage is clean, you can kick back and relax! 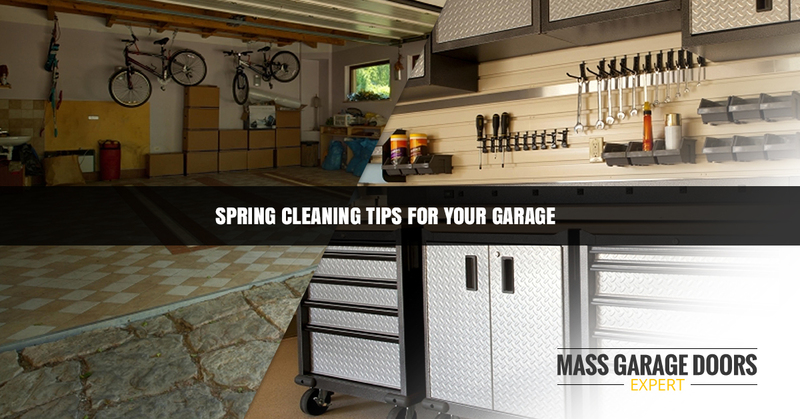 Enjoy the warm Boston weather and your newly cleaned garage. If there is anything our garage door repair team can help you with, just give us a call or contact us through our website. We’ll be here when you need us, 24 hours a day!